We are pleased to announce the establishment of a new workshop series focusing on “quantitative Biology of Signalling” in the context of the INFORM framework. These workshops aim at gathering scientisits working on different aspects of signalling at the plasma membrane. 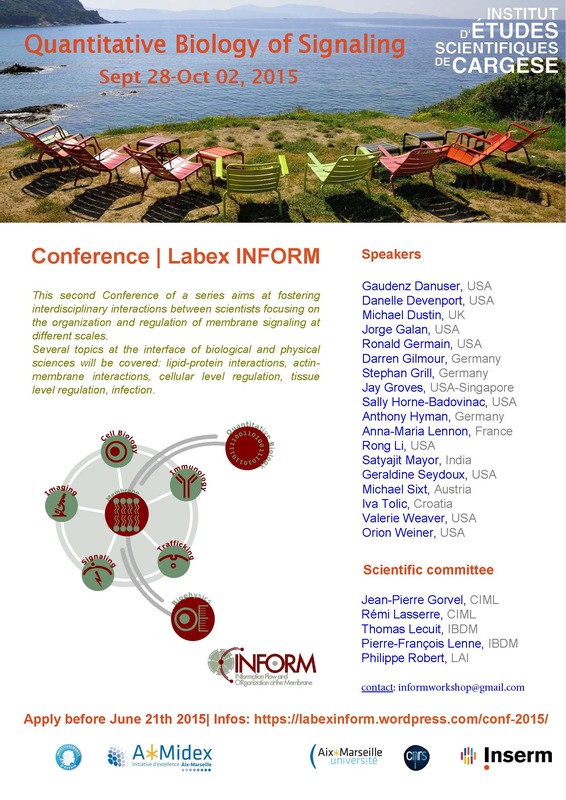 We also wish to foster interdisciplinary interactions between scientists focusing on the organization and regulation of membrane signalling at different scales: molecular, supramolecular, cellular and tissue level. The speakers list include: David Drubrin, Mickael Dustin, Suzanne Eaton, Maria Garcia-Parajo, Jay Groves, Carl-Philipp Heisenberg, Barry Honig, Edwin Munro, Ed Palmer, Ewa Paluch, Li Rong, Pierre Sens, Lawrence Shapiro, Michael Sixt, Tatyana Svitkina, Sarah Veatch, and Orion Weiner. If you want to participate to this event please apply with the application form before June 1st 2013, and send it by email at informworkshop@gmail.com.